Well it is officially the first M month of the year. Last year we declared those months for selfish knitting and or crocheting (or whatever as long as you are making it for YOU) So if you are being selfish what are you making for YOU? They are going to publish it! OK! My bonnet tutorial is going to be published on Thrifty Fun!!!!! Yippee! I am very excited. Jumping up and down…dancing….happy…happy….joy joy. Ok everyone pray for Katie,,,,as she begins to pack up her studio! Soon she will be settled in the new digs and will begin posting with me again. 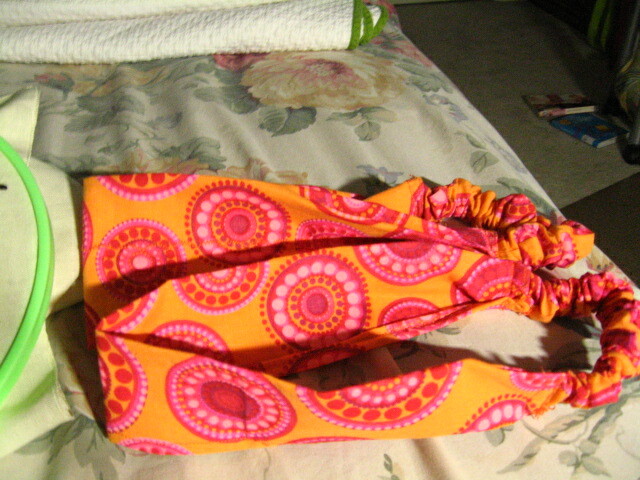 I have been making headbands, I gave one away for road testing to a pretty rough and tumble kinda girl. The colors suit her and I think she loved the colors. These were made from bandanas. I can get 3 out of one, 2 adult size and 1 child size. 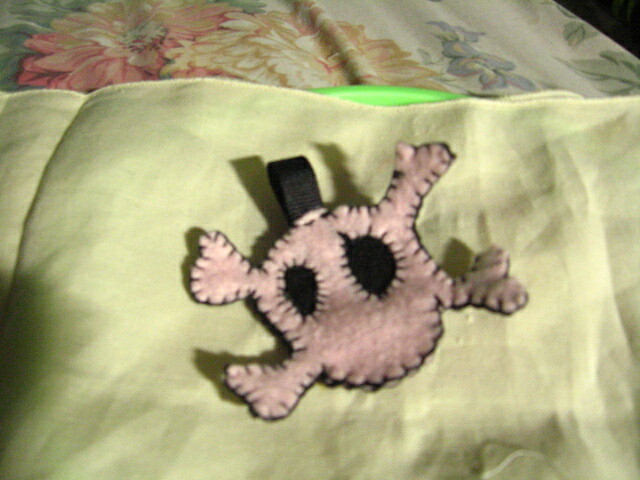 I embroidered a napkin with a chili pepper shaker, and had a special order for one of my felt skull and crossbone keyfobs in pink and black. I have one more headband to sew up from that bandana. 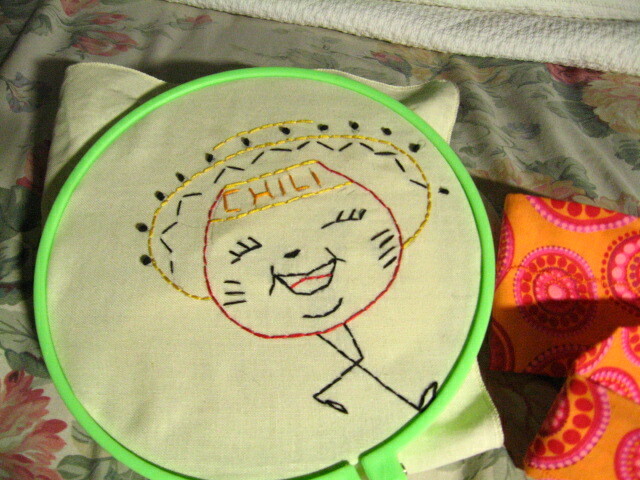 I am working on a Mexican embroidered shape doll, and I need to work on more Dia De Los Muertos Skulls. I have them all cut out and I need to get them embroidered. Next week I am going to get started on knitting my Eid gifts, and finishing up Hassan’s sweater vest. Ok,,,I am so excited I can hardly stand it. What was the big surprise? What fantastic thing did Mark have planned for you in NYC? Me! Well I am just sittin’ here in a dark ol’ house just me my windows media player, youtube, and the blog. Everyone is out at Friday Night Halaqa. I just couldn’t bring myself to go again this Friday. 3 Fridays and 3 Akikas is enough for a bit! Need a breather, plus I am teaching Sunday school tomorrow. And I just typed tomorrow I hear car doors shutting in front of the house…and the kids are ringing the door bell like idiots. I plan on sewing up some headbands tonight, cutting off a pair of pajama pants into capri length because the bottom of the legs are torn, and sewing around a couple of pincushions getting them ready to stuff. Ok…Ok…I know the title says, ” Knitting Our Way to Peace” and I swear, one day I will get back to knitting, but I am just having too much fun making things with felt and fabric. Hey felt is wool right? So I haven’t strayed too far. LOL…ok ok I am just justifying my abstinence now. I may actually KNIT some things for it too. Seriously I have to get back to knitting, I found the cutest pattern for snails that I just have to knit. I need to make a monkey and the monkey bag from the SnB book. OH and Congrats to Katie….the Cacti in the SnB 2008 calendar. I will have to buy that one this year and figure out how to get it autographed. You famous person you. Ok I am really pissed! My friend was sold a bracelet and the person who made it told her that the crystals were Swarovski and they so aren’t! Anyone EVEN ME who has ever seen the real thing knows a fake when it is presented. They were flat, not fire, no shimmer. SAD! Ok well enough about me.